Bundled with Lords of the Realm II. 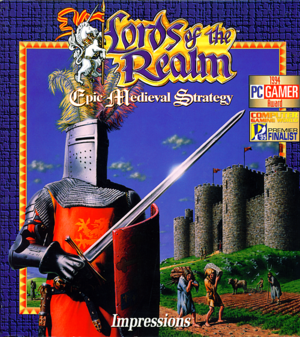 The GOG.com version includes both the floppy and CD versions. The floppy version is pre-packaged with DOSBox. Germany CD version save files are *.svg instead of *.sav. 320x200 only. Windows version runs at 640x480. Toggle with Alt+↵ Enter when using DOSBox. False for CD version. True for Windows, false for DOSBox. German retail only. Not available digitally. 2 When using DOSBox; DOS version only. 2 Using IPX tunneling; DOS version only. ↑ 2.0 2.1 File/folder structure within this directory reflects the path(s) listed for Windows and/or Steam game data (use Wine regedit to access Windows registry paths). Games with Steam Cloud support may store data in ~/.steam/steam/userdata/<user-id>/254920/ in addition to or instead of this directory. The app ID (254920) may differ in some cases. Treat backslashes as forward slashes. See the glossary page for details. This page was last edited on 14 April 2019, at 03:07.